Many home buyers are just as interested in the outside of a home as the inside. Realtor.com reports that 46% of men and 54% of women would make their buying choice based entirely on its outdoor space. Builders have taken note of the demand for livable outdoor space and are now incorporating these into new homes. Many newly constructed homes are including front and back porches as well as beautiful landscaping that may even include ponds and fountains. Builders are getting creative with patio spaces, which may feature stamped concrete or interlocking paving stones, plus plenty of room for fire pits or even gas fireplaces. Some patios even include outdoor kitchens, complete with heavy-duty grills, cabinets, refrigerators, and even pizza ovens. 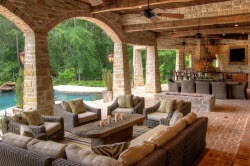 Yards may also feature pergolas or gazebos, some with ceiling fans or heaters so they can be enjoyed year-round. If you’re interested in buying or building a new home, talk to someone at The Haro Group. We’d love to answer your questions and put you in touch with people who can make it happen!